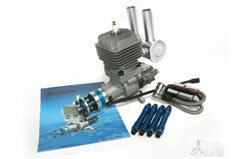 Pterodactyl 36cc Rear Induction Aero Engine V2 [PTE36RV2]. New V2 - Even More BHP!!! • Carbon Fiber throttle arm extension, mounting template, and prop template. • Ignition Battery: 4.8-6.0V NiCd or NiMH, 6.